As I've mentioned here before, Bubble is very into rainbows. Because of this fascination she sees them everywhere, anything that is remotely arch shaped or coloured reminds her of her 'favourite thing in the world'. Last night after dinner we had some watermelon and she delighted in lining up the rinds to make 'watermelon rainbows' on her plate. Today we added some paint and paper and made some slightly more colourful versions! First we dried our rinds with an absorbent towel and then laid them on baking paper. You could use any kind of surface for them, I used baking paper so we could put them down when they were covered in paint and they wouldn't stick when we went to reuse them. The girls loved painting the rinds with their brushes and paints. Then pressing them onto their paper to make the arches of their rainbows. This was a lot of fun and the results turned out really cute too. Even Squeak (2.5 yo) got right into this activity. Be warned though it was very messy, especially since we used both sides of our rinds to print with! These are so cute! We'll have to try them. Great activity to start thinking spring! These are gorgeous. My son will lvoe this idea so much. 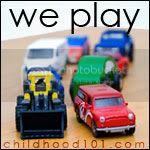 Thanks for the inspiration and thanks for linking up to the Kids Co-op linky. I featured this over on our blog today! Love it! These look like so much fun. 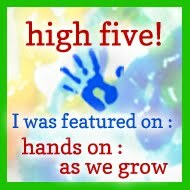 I featured you on my blog today as one of my favourite posts in the Kids Co-Op linky. What a fun idea for creating rainbows! I'll have to try this with my son! So clever, my girls would love this. My son loves watermelon. We will have to save the rinds to do this project.